Usually on Thursdays, I write about a simple moment that is a part of the bigger picture, a meme sponsored by the beautiful ladies of Bigger Picture Blogs. One of those wonderful bloggers, Sarah, lives in Joplin, Missouri, which less than a week ago was hit by a major tornado. The photos on her blog, This Heavenly Life, tells all. 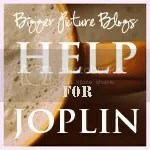 The other members of Bigger Picture Blogs are holding an action to help Joplin through this devastating time. The auction is taking place right now…Thursday, May 26 and Friday, May 27. UPDATE: The auction has been extended to 9:00 a.m. (CDT) Saturday, May 28! Every hour another wonderful item is up for auction, and all you have to do is leave a comment to bid on the item of your choice. All the items have been donated by generous sponsors, and all the proceeds will go directly to the Salvation Army’s Joplin Relief. You can even make a donation without bidding on an item. Please visit Bigger Picture Blogs now, and give Help for Joplin. Thank you so much! A preliminary calculation has shown that the auction raised more than $1600! We know that each and every dollar raised will be put to the good use of helping families in Joplin recover from the devastation of the May 22, 2011 tornado. Oh Ginny, thank you for posting this. I just looked at Sarah's pictures, and it broke my heart.On a completely different subject, I keep wanting to do another Turning Back Time, but I can't figure out when you're posting the prompts. Let me know and I'll jump in again. I came over from BBC Chicago Roll Call thread.What a great idea for a fundraiser. I just went over and left a bid. Thanks…my son and his company are taking part of the profit from repairing roofs from all our hail storms to go to the victims of the tornadoes…I has been unreal. I have been praying for what we should do…thanks for more info and a direction. Thank you. I will go over and check it out.Keeping Joplin in my prayers.